Yep, that described my nests pretty well: I had woven my world into these collections of objects, and these nests provided clues about my life and my environment. Just as some birds build nests out of a variety of found objects, similar structures could be found in my own house (reflecting that propensity of the affluent members of my species). Although the parallels are not complete — I was not using my nests to attract mates or raise young, for example — the label stuck because of their key characteristic as a group of disparate objects collected together in a discrete area for the purpose of storage or retrieval. – They were usually areas which contain things that I wanted to get rid of. – Many of the nests were very visible, so it made a noticeable visual difference whenever I cleaned one up. – Even for nests that weren’t so visible, for instance nests in the basement or in closets, it made a noticeable psychological difference whenever I cleaned one up. I could look at that area, remember how it had looked previously, and feel some sense of satisfaction by noting the difference. – Nests were discrete areas that I could focus on one at a time if I wanted to. 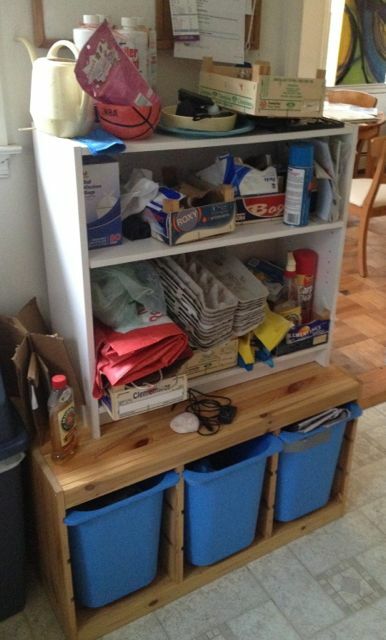 My “discovery” of my nests was one of the main ways I encountered the ambiguity of having treasure/a lot of things. Some nests were full of things that clearly had value to me, such as the kitchen cabinets where pots and pans and dishes were stored. Some of these nests were clearly useful, such as the coat tree and the recycling area, and some of them were highly organized, such as the closet shelf which had almost all of the board games (as well as a few other unrelated items). And not all clusters of things were nests; for instance, a group of family pictures on top of the dining room cabinet was there for sentimental value. So even though some of my nests may have look disorganized to an outsider, they didn’t necessarily bother me if I knew what was in there and where everything was. Most of these nests, however, were not quite so benign. Many of these nests had long ago lost their purpose or never really had one to begin with: things just gravitated to certain places and settled there without any particular purpose or value. As a result, a nest became a problem if it was difficult to find anything within the nest. I felt this when I couldn’t find something I wanted to find because there were too many other possessions in the way; I thought I knew where I’d put it, but it wasn’t there. This happened most often with nests consisting of lots of little objects or piles of paper. Things that were sometimes difficult to find in my house — candles, flashlights, duct tape, particular documents — were difficult to find because I wasn’t consistent about which nest I placed them in and because there were so many possible nests to choose from if I couldn’t remember where I’d put the thing. My home office was a particularly daunting collection of nests — or was it one giant nest? Even after considerable clutter control efforts had made a noticeable dent in the problem, a lot of stuff remained. What bothered me the most was that sometimes important things got lost in these nests. I would find something in a nest and realize that this could have come in handy if I had thought about it. This happened even if I’d thought I was being organized. For example, I would create a folder on a particular topic of interest and put related items in there for future reference. That sounds pretty organized, doesn’t it? Except that I would not remember to look in that folder for awhile, sometimes even for years.